What exactly am I looking at you ask? 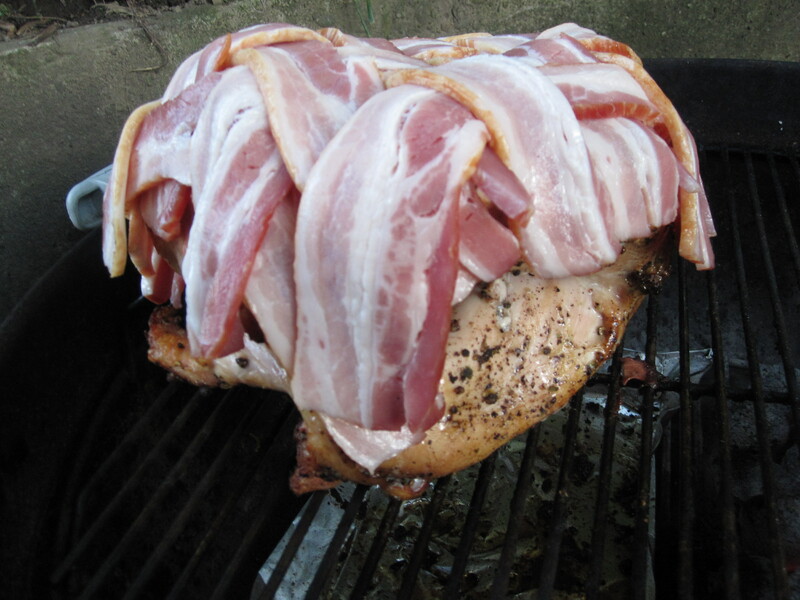 This is obviously a turkey breast on an indirect heat charcoal grill with a blanket woven of bacon on top of it. Obviously. 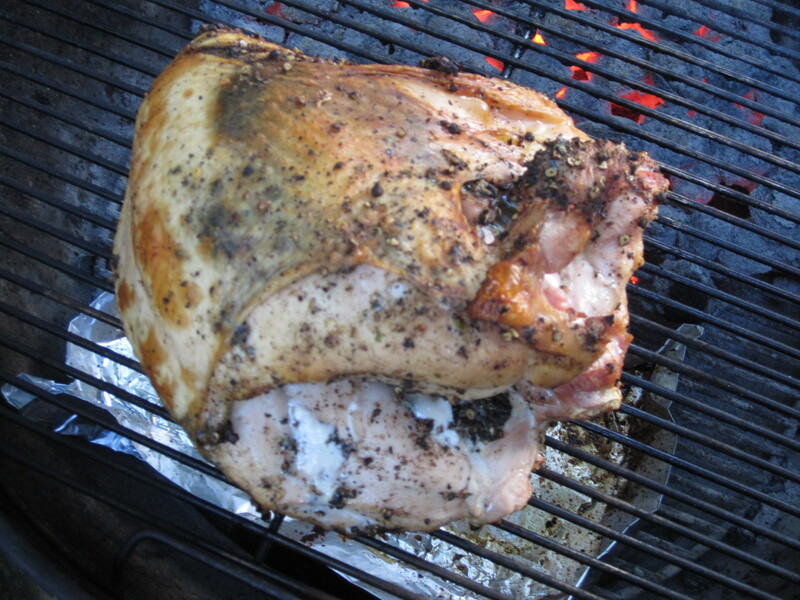 I wanted to squeeze in some good grilling as the season was about to close and a cheap turkey breast from Wholey’s (about $14 for this 8 pound double breast) offered a great opportunity. 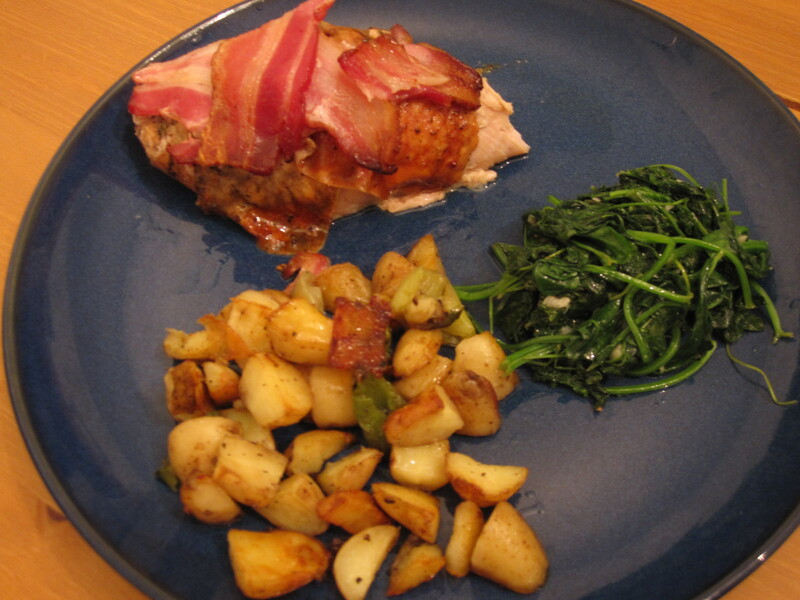 I have made this before by roasting the turkey and have indirect heat grilled a whole turkey, so the bacon was what differentiated this post from the others. 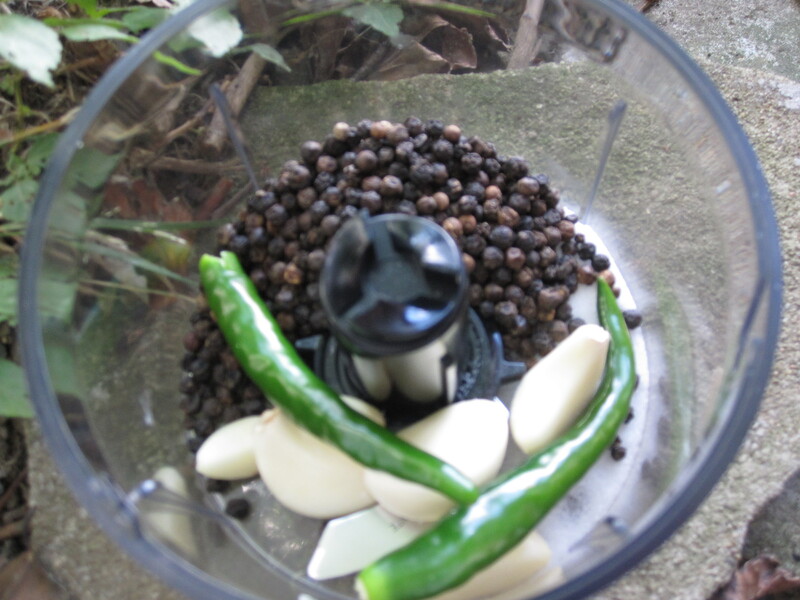 I started by making a rub for the turkey consisting of peppercorns, salt, garlic, and a few hot peppers from the garden. 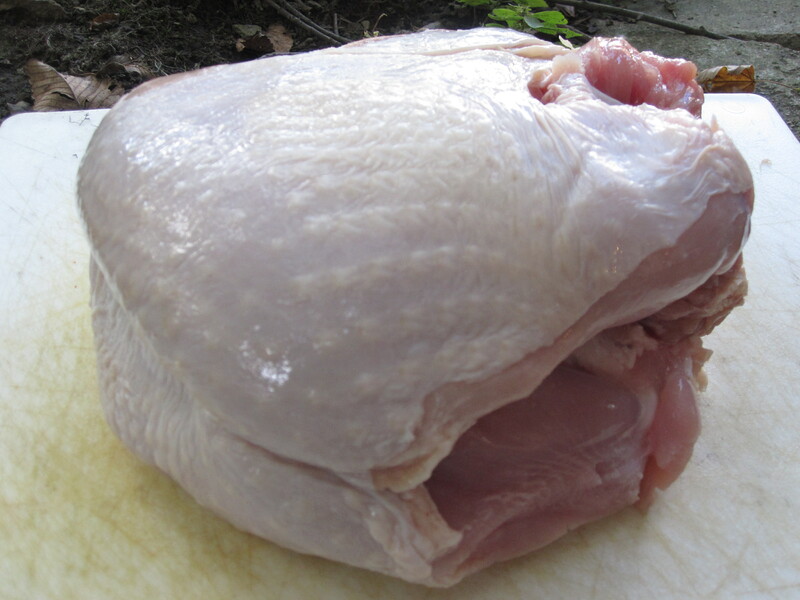 Wholey’s often has fresh turkey breast but this was a double breast and basically the torso of the turkey. I don’t know if they removed the wings and legs to sell separately or what. You usually don’t see this option in grocery stores. Either way they are delicious and versatile without having to commit to a whole turkey. 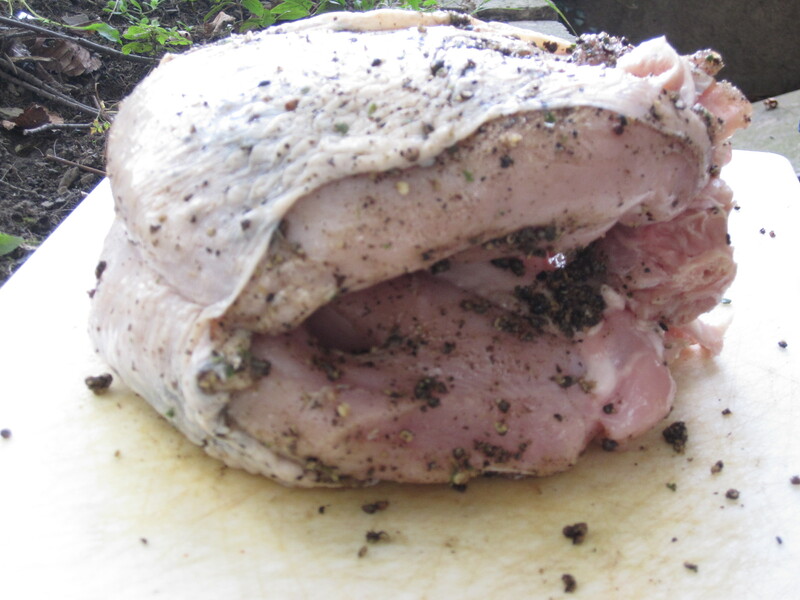 I put the rub inside the cavity, under the skin, and on the outside so I covered it on every surface I could find. 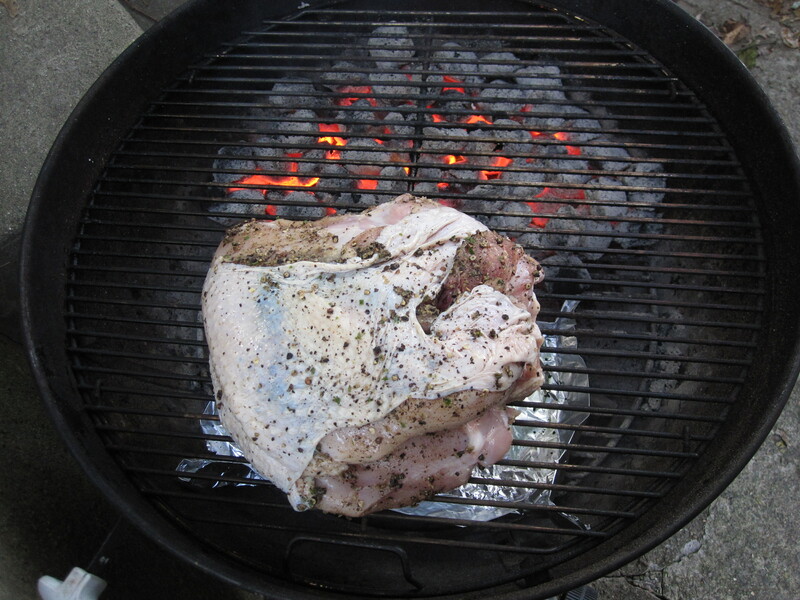 I prepared a charcoal grill with all of the coals on one side and a foil drip pan on the other. I had the lower air intake fully open and put the lid on with the upper air intake about 50% open. 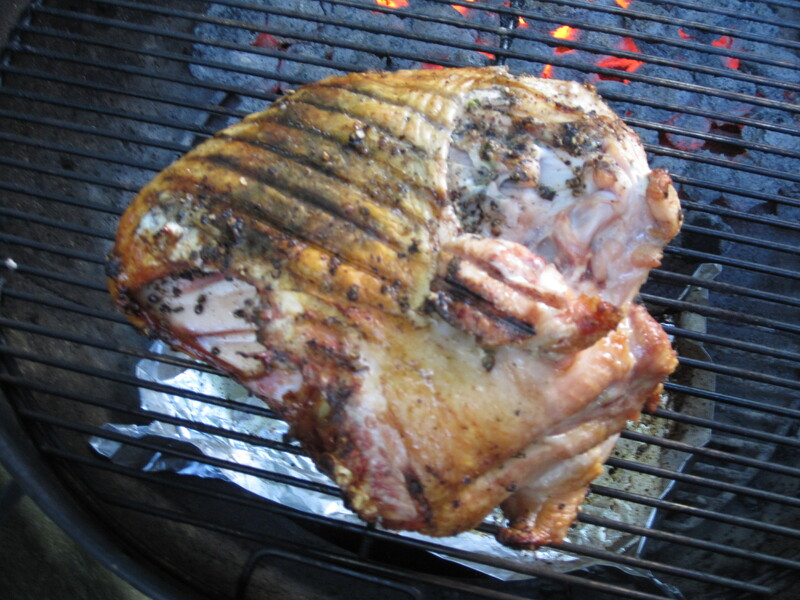 I am a big fan of indirect charcoal grilling (pulled pork, brisket) Here is after about an hour and then flipped. 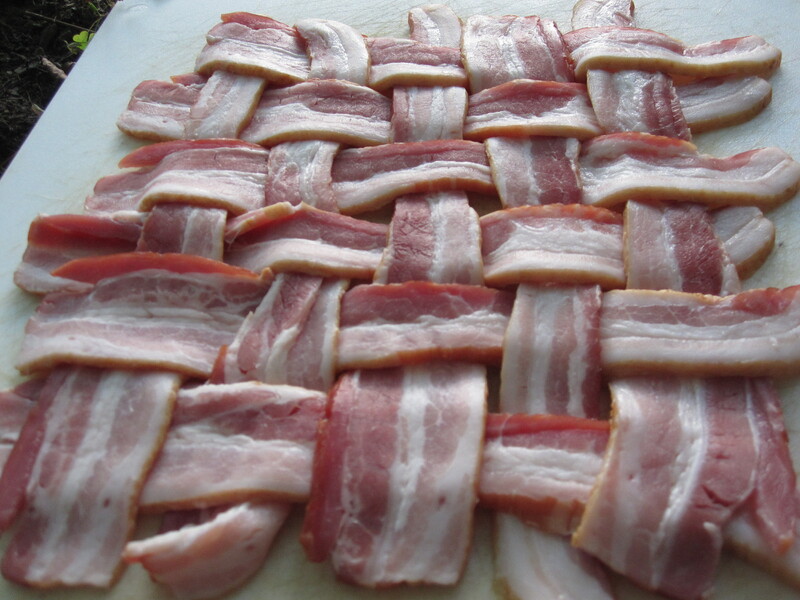 In the meantime, I took a 1lb package of bacon and wove the bacon into a mat. Everything about this was hilarious, beautiful, and naturally meant to be. 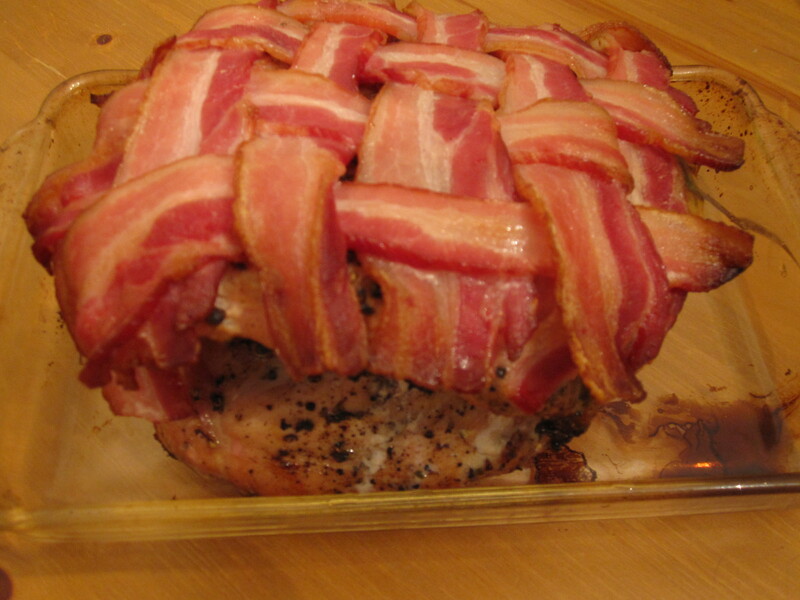 My thinking was to flip the turkey like I did above and then cover with the bacon blanket for the second half of the cooking. 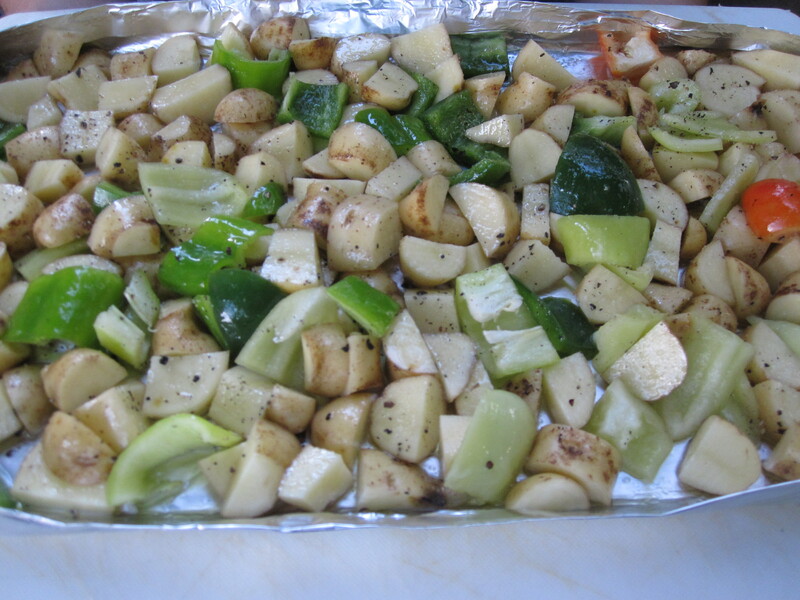 We made a side of cubed potatoes with some peppers wrapped in foil and placed directly over the coals. After about another hour the bacon, turkey, and potatoes were ready to go. The bacon was not cooked as much as I thought that it would have been or wanted it to be. In the future I would put it on earlier, but am not sure about putting it on one side and then having to flip it and keeping form. It was a great meal and there was enough bacon to spread to most bites. This also made plenty of lunches throughout the week in the form of salads, sandwiches, and similar to above with the leftover sides. 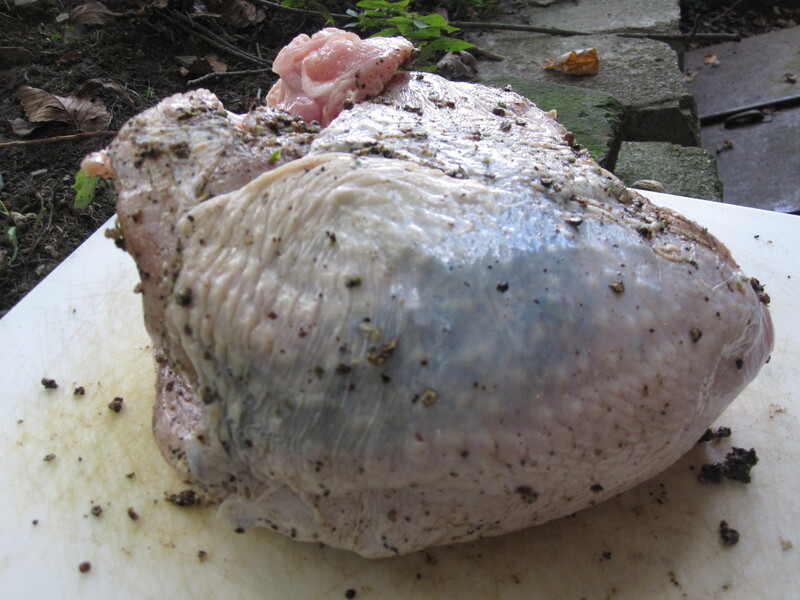 We barely made a dent in the turkey the first time around and it really was a great value! 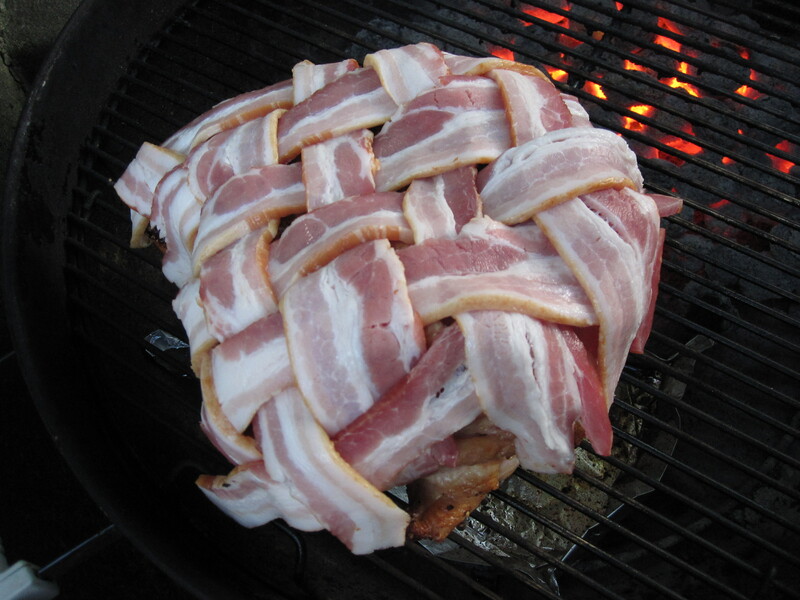 This entry was posted in Turkey and tagged bacon, Charcoal, garlic, grilled, indirect heat, peppercorn, potatoes, salt, Serrano peppers, turkey, woven. Bookmark the permalink.